Donald Scott led the pack during the Toyota Tundra Bassmaster Weekend Series, operated by American Bass Anglers, Mississippi Division 17 tournament, held April 20, 2013, on Pickwick Lake. Running out of J.P. Coleman State Park near Iuka to fish the 47,500-acre Tennessee River reservoir, the Guntown, Miss., angler caught five bass weighing 19.32 pounds with a 5.37-pound kicker. For the Boater Division victory, Scott took home a check for $1,816. In second for the boaters, Garrett Riles of Potts Camp, Miss., brought in four keepers for 14.80 pounds. He anchored his bag with a 6.06-pounder that topped the tournament lunker list. For second place, Riles collected $908 with another $160 for the big bass. “I caught all my fish on a peanut butter and jelly jig in 15 to 20 feet of water,” Riles revealed. Will Dupler of Columbus, Miss., landed four bass for 14.48 pounds. His biggest bass weighed 5.13 pounds, netting Dupler a third-place check for $605. Michael “Kyle” K. Worsham of Cherokee, Ala., scored a five-bass tournament limit going 12.97 pounds for fourth place. Taking fifth place among the boaters, Brian W. Parker of Corinth, Miss., landed a five-bass limit for 12.04 pounds. In the Co-Angler Division, Brice Cohea of Ripley, Miss., won with three bass at 11.20 pounds. He capped his catch with a 4.20-pounder to pick up a check for $908. “We fished staging areas all day long with shallow-running crankbaits,” Cohea said. Donny H. Davis of Tuscumbia, Ala., took second place among the co-anglers with a three-bass division limit going 10.61 pounds. He pocketed $454 for the effort. In third place, Dan L. Turner of Tupelo, Miss., landed three keepers for 9.58 pounds. His biggest bass, a 4.70-pounder, took division big bass honors. Turner earned $303 for third place and an extra $80 for the lunker. 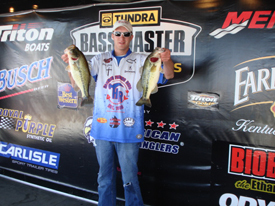 Heath Bookout of Collierville, Tenn., landed in fourth place with three bass and 8.89 pounds including a 4.10-pound kicker. Jason J. Smith of Killen, Ala., rounded out the top five co-anglers with a three-bass limit at 8.69 pounds.